One brave sports car owner in San Diego wasn’t going to let torrential rain and massive flooding caused by El Niño get in the way of a midday drive. 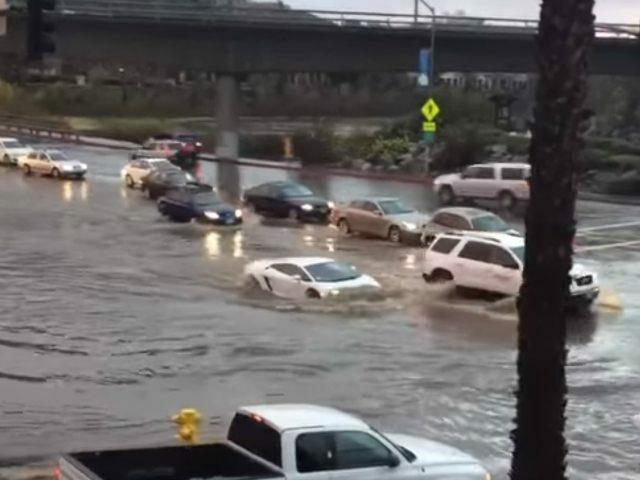 A video captured by an astute cameraman and uploaded to YouTube on Wednesday shows an unidentified driver piloting a Lamborghini Gallardo through what was basically a miniature lake on the streets of San Diego. As the video shows, the driver of the Italian sports car barely even slowed down as water engulfed nearly the entirety of the car, up to the top of its windshield. The radiators at the front were inevitably soaked from the car’s attempt at becoming a speedboat with water potentially even entering the exhaust. As the Gallardo is mid-engined rather than front-engined, it wouldn’t have been as badly affected by the water as a normal front-engined car, due to the absence of air intakes at the front, reducing the risk of hydrolocking. Even still, it seems likely that some water got into the side air intakes that feed the engine, potentially causing some damage. Furthermore there’s a strong chance some electrical damage could have been done. No big deal, right? The Lamborghini Gallardo only retails for about, oh, $200,000 or so. Storms brought on by El Niño continued to devastate parts of California on Wednesday and Thursday, with reports of widespread flooding, power outages, and road closures across the state.